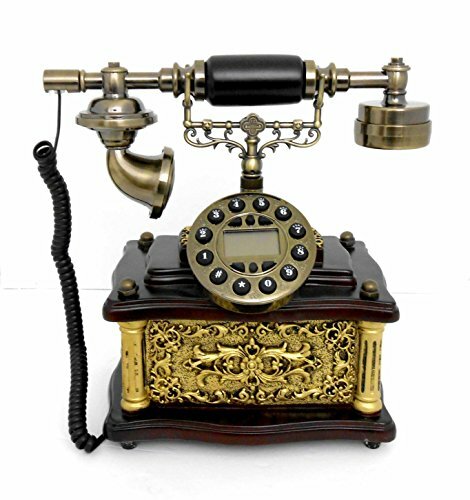 Retro style push button dial desk telephone / Home decorative # 1717 A brand new handmade decorative phone, Victorian style. It is made from wood & resin. Telephone from China factory MS-1200D, brown wood color will adds a good texture and decoration to your home. Product specification: manufactured by LNC line, OEM or ODM service are available. The box contains one English original guide. Please see images for more details. This is a unique item and is well designed to meet your expectation. This tempting item makes an exquisite statement in any decor ornament on the table or your bedroom. The item grabs the attention and enriches your house. Item # 1717 Telephone Dimensions: Length: 8.9" Width: 6.5" Height: 11.25" Weight: 5lb + 6oz About us: Check out our other items. New items will be posted daily. Feel free to contact us for any information about our product or any product that you might be looking for. Quantity available upon request. Terms of sale: We offer a 14 day return policy on all our items with a full refund, return shipping cost will not be included. Payments: Payment must be received within 3 days after the purchase is complete. Any applicable duties / customs fees for shipping outside the United States are the obligations of the buyer. Please contact us for worldwide shipping. Shipping: We ship by USPS and UPS mail only unless special arrangement is needed. Please make sure that we have your correct address and PO Box if necessary. If you are an international client please make sure we have a valid address for you in english to avoid shipping delays. Item type: Retro style push button dial desk telephone. Product weight : 5lb + 6oz. Size : 8.9" x 6.5" x 11.25"
It is made from wood & resin. If you have any questions about this product by Nabil's Gift Shop, contact us by completing and submitting the form below. If you are looking for a specif part number, please include it with your message. Decorative & Gift Item Antique Replica Working Rotary dial Candlestick Telephone. Candlestick Telephone Decorative Shinny Brass Antique Reproduction Rotary Dial.